Several weeks past, the Capital Grille launched its seasonal deal on a gourmet burger and a delectable glass of wine, hand selected by their master sommeliers. I was invited in for the experience by their local management at the Front St, Hartford location – and they graciously comped the check and, as with previous entries, approved this post prior to publishing. Just a bit of full disclosure here folks. And oh my, was it a rich and mighty pairing. We dined on the patio. This offer is available at the bar, the patio, and in the main dining room for lunch. Behold our mighty wine line up! 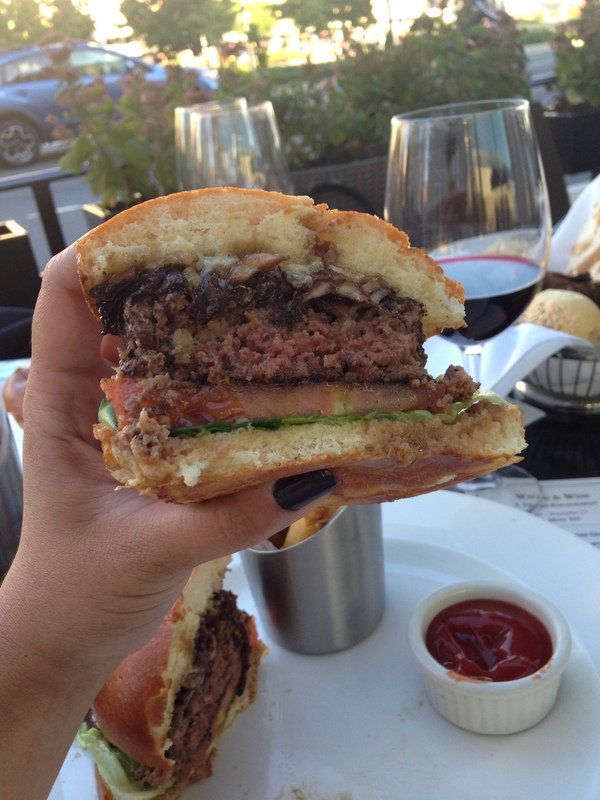 This year, the choices for the wine and burger pairing are: a Wagyu Cheeseburger (havarti, fried egg, and crisp onions), a Kona Crusted Wagyu Burger (shallot mayo) or a Wild Mushroom Wagyu Cheeseburger (15 aged balsamic). This is up from two burger choices last year. The wine pairing options are: Jordan Cabernet Sauvignon (Alexander Valley, 2010), and J Vineyards Pinot Noir (Russian River Valley 2013). Also noteworthy: these two wines are excellent, revered, and very rarely available by the glass. So that’s all kinds of fancy. It was with great difficulty that I settled upon the Wild Mushroom Wagyu. My husband, Michael, selected the Kona Crusted Wagyu. We were blessed with two glasses of wine thanks to our lovely server, who saw us hemming and hawing and graciously brought us both options to try. I ended up drinking most of the cabernet and Michael took care of the pinot, based on personal preference. 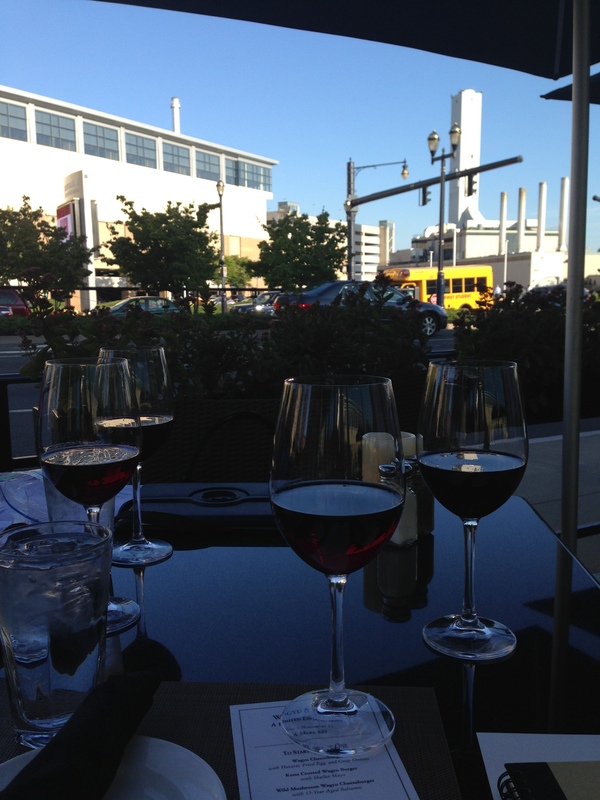 Flavor wise, the Jordan Cab charmed me with its complex berry aromas and tart sweetness. I love a good, full bodied red, and this one in particular sang with lots of high fruit notes which made it an excellent summer to fall transitional wine. the J Vineyards Pinot was also excellent – lighter than the cab (of course) and silky smooth, also with plenty of notes of fresh berries. My husband very rarely drinks reds and he was surprised by how much he enjoyed it. In presentation at the table. 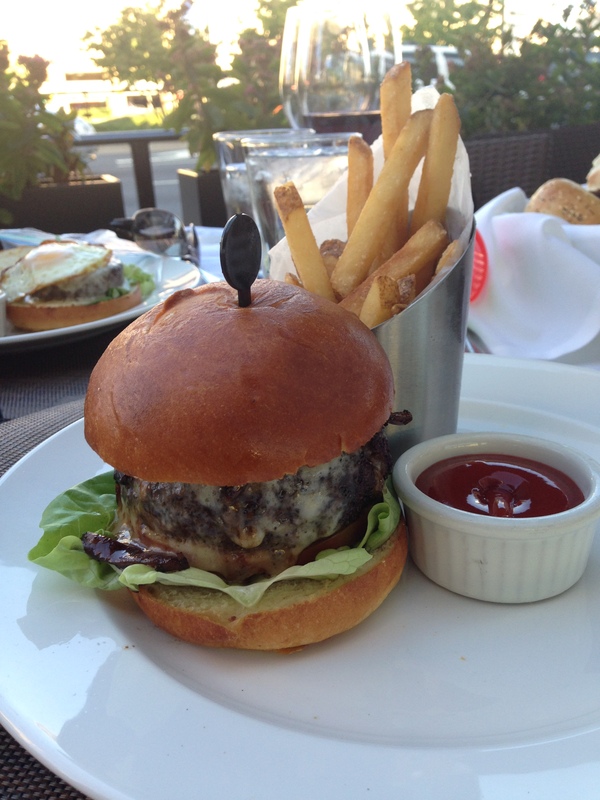 Pictured nestled lovingly next to the burger: delicious truffle fries. Sliced open for further investigation. Note the perfectly pink center. I should really investigate the type of balsamic that Capital Grille uses. It’s just marvelously complex, tart, and brings out these amazingly three dimensional flavor palates in the food. 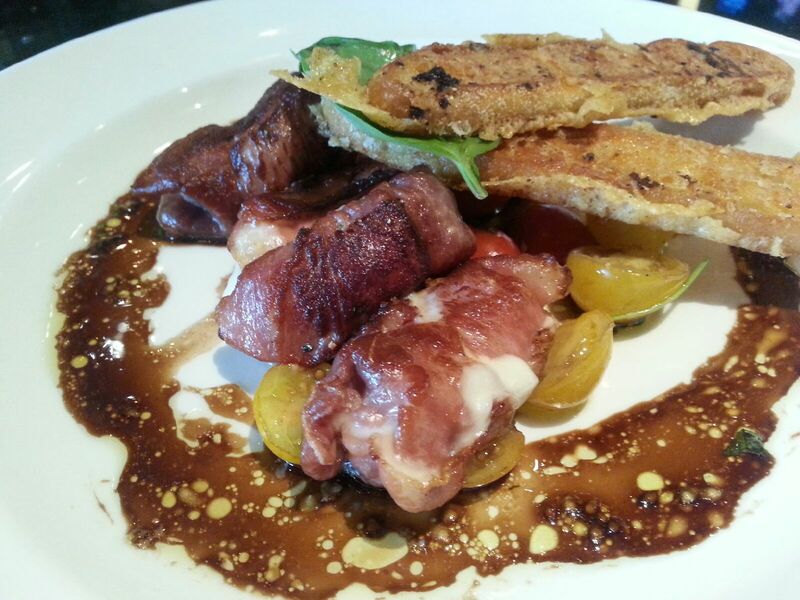 I became acquainted with this fine balsamic during a previous post, on the plate with prosciutto wrapped chicken. The balsamic alone made me glad for my burger choice, and the creamy mushrooms complimented the flavorful, fatty wagyu beef quite nicely. I DO want to go back to try, well, both other varieties actually, but most definitely the Kona Crusted Wagyu. Sadly, I forgot to even ask for a bit of my husband’s Wagyu Cheeseburger, and by the time I thought to ask, it was gone! There is plenty of opportunity to return, thankfully – as the event runs until November 23rd. 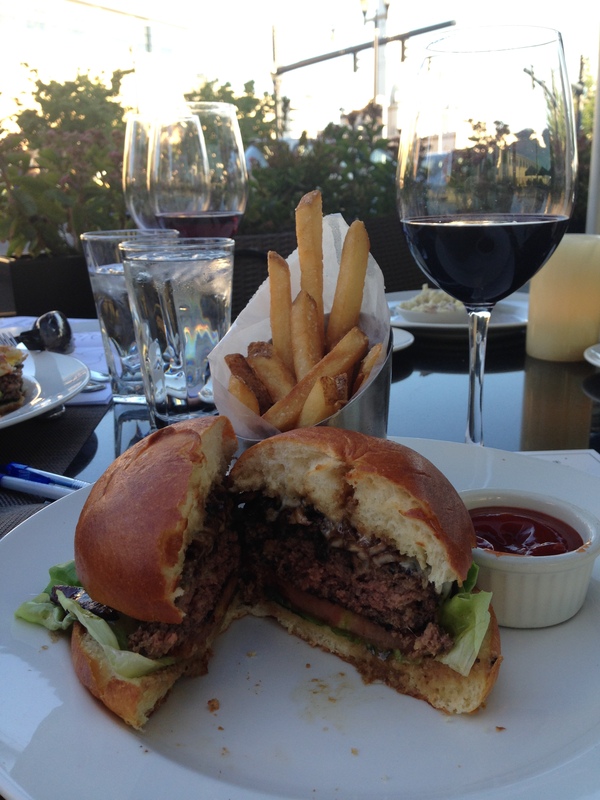 For the $25, you receive both the burger and the wine, and a second glass of wine may be purchased for $20. I really can’t recommend this promo enough – go and enjoy it before it’s gone! There is a Capital Grille in Stamford and I have yet to go. Mostly because I look at is as being too fancy…and I don’t eat red meat. Given that, I still can’t help but think that burger looks REALLY good! I would definitely order that chicken dish! Yum!